Gum disease is a highly preventable condition, yet is the leading cause of tooth loss among adults. Rates of gum disease are rapidly growing among the total population, with significant increases being observed in younger generations. Gum disease is not only dangerous to your oral health, but has also been shown to be an indicator of whole-body diseases. Gum disease begins as gingivitis—inflammation of the gums and tissues of the mouth—and rapidly develops into full-fledged gum disease if left untreated. 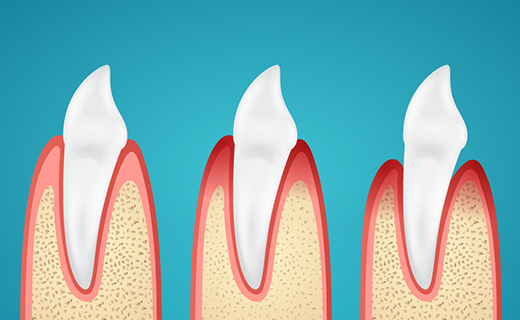 Know the signs and symptoms of gum disease and what causes gingivitis can protect your health. Gum disease is the result of bacterial buildup that remains untreated and develops into an infection. In the early stages, the inflammation of the gums, also known as gingivitis, is highly treatable. The early stages of the infection cause an immune response, leading to redness, irritation, and inflammation of the gums and tissue surrounding the teeth. If the infection continues to worsen, pockets may form around the teeth and gums, leading to swelling, soreness, loose teeth, and eventually tooth loss and damage to the bone of the mouth. Gum disease is responsible for 70 percent of tooth loss among adults and must treated quickly to optimize outcomes. You can prevent gum disease with a healthy lifestyle and diligence to your dental care routine. Twice-daily brushing, at minimum, is essential for removing food and bacteria that can contribute to tooth decay. You must be certain to not only brush often, but thoroughly, as well. Experts recommend dividing the mouth into quadrants and brushing each section for 30 seconds, for a total of two minutes of brushing. Flossing should occur at least once daily with similar diligence. Floss for two minutes working between all teeth from the back to front of the mouth on both sides, top and bottom. Flossing gets areas between teeth that your toothbrush can’t reach, including improving the impact of fluoride in toothpaste and mouth rinses, especially along the gum line. A healthy diet can also help prevent gum disease. Foods that are rich in sugar and starch can aid the bacteria that cause gum disease and inflammation. Choose fresh fruits and vegetables as main staples in your diet. Drink lots of water, including fluoridated tap water. There is periodontal disease treatment, but it can be uncomfortable and expensive. It is best to practice prevention. Talk to your dentist in Virginia if you have concerns over inflammation of the gums or other issues with your oral health. Excellent service and nice cleaning. I have been going to this location for years now. Highly recommend it. Each staff member was very helpful, professional and informative.